So many symbolism. At one point reading the book, you will do this. Spread your palm in the cover and –realizes-. Gdmmt its Haruki Murakami’s work, what more reason do you need? Growing up, you must have a group of very close friends that might give Mighty Morphin Power Rangers a run of their money. Friends you hang around together, so often you gave each other assigned name, rank or even color. Somebody is red for leader, blue for being strong and brash, green for their calmness and yellow/pink/white for the ladies. But like every epic TV series, things went south. Friendship shattered and trust gone, such thing happens everywhere and it also happened in Nagoya city to Tsukuru Tazaki and his precious friends. So it took me 22 months to finish J.D Salinger’s Catcher in the Rye book. Not because I’m a slow reader, I actually finished three-fourth of it at the first week. But because at one point, I hurled that book to the wall and stopped my self from reading it. The book hits to close to home. It hit waaaaaay to close to home. It’s scary how a book can affect you in such a holistic way that it halted you from thinking. I guess that’s exactly what makes the book such a quality read. It made you hurl, stomp and weigh your mind so very much. Few days ago I had a comment thread chat via AO3 with an author, we discussed things around Panic Attack, emotional breakdown and what makes people snapped. At some point I paraphrase this thing from a postmodernism book I read, that whatever movies, books, literature and entertainment offer is a form of simulation for us to deal with IRL problem. For me, Catcher in The Rye is a scary book because it explains things that I did not understand about a certain somebody. At some point I did got depressed, but I don’t think I’ll ever regret reading it. Just need to sit down and sort my mind before it eloped with my sanity to the rabbit hole. I’d recommend you that book, only if you can promise not to compromise your emotional state. It’s a classic book, with a plot that became ever so real and general in real life. I proudly presented my self as somebody who dislike working over hours and staying up late into the night. But sometimes special circumstances calls for desperate measure and I’ll be rolling deep into the midnight. Staying up late is not my thing, god I hate it as much as chewing raw veggies. But when there’s 37 papers which need a speedy review and minor editing, continued with compiling all of ’em into one gigantic stack of PDF, forgive me for cussing and waving my one finger salute here and there. Blergh, I found it silly that some people failed at writing diction and reference. Some else decide that it will be cool to insert big pictures and lots of gaps to fatten their paper. Some people are an arse by being so uncooperative they decide its cool to play hooky when you’ve been ringing them since the morning. My eyes are bleary and when I wake up in the morning, it will be that ‘natural-smokey-eye-make-up-look-a-like’. Sometimes people have the need to prod and nub their eyes with chemical substances to achieve such result, when it was really simple (yet unhealthy) to reach the same end. I’m tired, and cranky but not sleepy. Just how awful is that.. The last time I felt like this was after watching a horrendous Thailand horror movie. It was so scary it gives me jitters for the next few days. Sleep won’t come easily after all these stuff. I’m really waiting for something to knock me and lead me to the wonderful world of sleep. IDK, since I’ve been rambling here and there for the past few minutes, I thought it won’t do any harm post this silly rhyme I made. It made the mind less intact. Is it pleasurable at twice? Something I made during a traffic jam while I was driving the car, the radio was playing a weird old school punk song. And the song was not helping the jammed mood at all..
Tut tut, I have a knack for anti climax post. Love you, stay safe and take care..! As the class president and chief-in-editor of the upcoming 2 Dunia Satu Kajian, Film Horor dan Roman Indonesia, it will be a total bull if I’m not the least annoyed. This position is a major upgrade from my usual reviewer, beta reader and plot discussion acts in FF.net. It has been a 6 year experience of lurking as an on-and-off reviewer and semi-beta-reader there. Wow.. That’s quite a long time if I think about it again. So what does a chief-in-editor does? Quite vexing if I may admit. Lots of chasing, editing, searching for reference, cross checking the dates, names, terms and definition. It’s fun but it is taxing.. Especially if you’re working with human beings that doesn’t understand the definition of deadline. Some people have trouble with working around the deadlines, when it was really simple if you now how to. The trick is to keep in touch with your agenda and make sure everything is up to date and do-able. We’re not trying to make a miracle, but simply making means to an end. Deadlines are not scary, for me personally, it’s a mood and creativity booster. It also teach us to be responsible and to have a target and ends for every project. It’s not right to stretch a task into the infinite and beyond, it’s perhaps the single thing you will regret the most in the future. Work your deadlines, chase away those laziness and make sure your references are up to date and available. That’s really what I want to yell at the papers I’m handling. So much to do, so little time. Sacrifice your lunch and dinner and those moments you spend snogging with your pillows. Maybe I’m a work-a-holic, perhaps I’m a perfectionist, and I might as well a demanding control freak. But this is how I roll. Let love be your salvation. Definitely SFW, non-romance, England centric. A cheesy love quote which I adore, ‘Love finds you in the most unexpected way. It jumps on your shoulder and clings you tightly’. 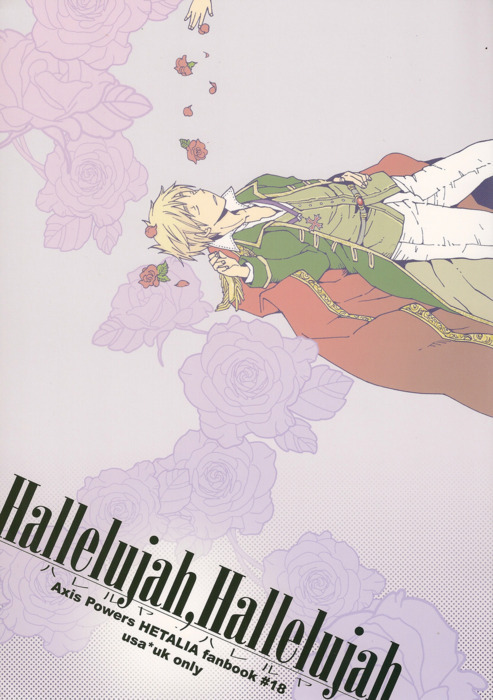 Let’s have Leonard Cohen sing ‘Hallelujah’ while reading this particular doujin shall we? 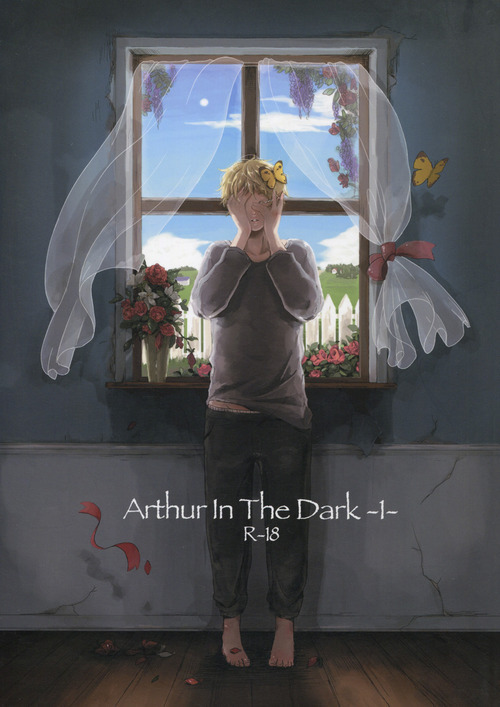 This doujin is not as complicated as Arthur in The Dark series (which have reach the 4th installment, mind you..). But it does address several key points why England is a particular…..person. England’s conception, or Arthur’s childhood didn’t start off well. He was unliked, loathed and hated by his fellow northern territories brother. Yet he always tried his best as a growing (and hated) nation could be. The King requested him to use the spirit for the goodness of the kingdom (or for the king’s personal gain? IDK.. interpret it the way you want). Arthur realize that it is essentially his job to abide his King’s request, but to use his friends for such quest? It didn’t came easy for Arthur to reach the decision, but the faeries point out that they are friends, and friends help each other. And that was probably the first time for the many next to come which Arthur use magic for such reason. What he gain was a twisted form of affection. His state as a nation started not with love from his people (or his King), but from the way they could exploit Arthur in returns of their affection. Eventually Arthur realize that he can never received the love human exhibit and he have made peace with it. As long it’s an attention which drive him as a nation, it shouldn’t really become a bother. Eventually he meets Alfred in the New World and immediately become his brother. When Arthur took Alfred to bed and told him stories of dragons and village, Alfred cling to him desperately. When it finally reach the time to sleep, Alfred claimed that he want to be hugged by Arthur while sleeping so he could have Arthur in his dream tonight. With a sleeping Alfred in his arm, Arthur realize with a start the suffocating emotion in his heart. He couldn’t breath, it was crushing and with tears in his eyes he realized those feelings to be love and pure affection. I guess once in a while we need to really look at the definition of love and put aside those romantic behavior. Love is not only about fluttering feelings, skimming hands, eye contact and rapid heart beats. Its also about acceptance, friendship, family and those moment when you are humbled by an unassuming event. I realized love when my friends hugged me because they haven’t seen me in a while. I realized love when my little brother made me a lovely breakfast set. I realized love when my Father switch side when we were crossing the street so he was the one facing the ongoing cars. I realized love when my mother checks me late at night and remind me not to overdue my self. Love is everywhere, and it’s what made you warm and so alive. Warning, this doujin contains a heavy R18 scene. You’ve been warned…. But putting aside those few panels, it’s very good and depressing. There is something truly lovely and derange about this doujinshi. In a way it addressed some manic themes like depression, obsession, one sided love and being so very egoist that you’ll cast humanity away. One morning Arthur woke up blind. But instead of being panic and shocked, he brushed off the sudden impairment and tried to continue with his life like the usual. Britain is the Great Britain not for nothing. Some days passed and Alfred came to visit Arthur who’s been absent for the last few meetings. He was confronted with a seemingly dazed and odd Arthur. At first he dismissed it as Arthur’s sign of fatigue due to waking up by Alfred’s visit. But when Arthur miss poured the hot water into the floor, Alfred reached for him and realized Arthur’s unfocused green eyes. Arthur confessed for his sudden lack of sight, and something inside Alfred snapped. Myriads of emotion, obsession and his dark desires at the verge of breaking through the thin red line. For a moment Alfred imagined taking advantages out of the blind Arthur to release his long time frustration. But instead, he carried Arthur to the couch and starts mending the mess Arthur has made to his once well maintained house. Later on Alfred tried to talk sense to Arthur, he accused Arthur to knock his head, scratch his eye or hurt somewhere and need immediate treatment to the hospital. Yet Arthur denied all this and claimed that he’s not suffering by his blindness. Another string snapped inside Alfred’s mind and he was left speechless, because Arthur’s statement literary meant that he has given up. Storming out of the house, Alfred left Arthur claiming that he need some fresh air and that the sight of Arthur made him depressed. Alone, inside Arthur’s mind a pirate, perhaps a shadow of his past egoist self, showed up and commended Arthur for whatever he’s doing. I haven’t fully understand this part, yet. The pirate asked what Arthur will do about his lovely little brother, and Arthur told the pirate that he’ll go find him. Meanwhile, a hunched Alfred was reminiscing a time when ‘brother Arthur’ told little Alfred that his blue eyes are the most beautiful color. It reminded Arthur of the sky and sea he loves and this statement made little Alfred the happiest ever. Almost immediately, Arthur found him in a hill that overlooked the vast greenery of (maybe) England’s country side. Jokingly Arthur told him that he’ll made it through this blindness, that Alfred doesn’t need to worry, that he’ll tend to the garden and house after he’s settled with his blindness. Alfred’s only response was his question whether Arthur could possibly know what kind of face he’s making. Which Arthur answered with a hug. I’ve known ever since I followed this link that nothing good will come out of this doujin, and I’m severely glad that my assumption is not wronged. The second part explained everything, down to Arthur’s personal wishes, obsession and those dark side which Alfred never sees. This doujin alongside with it’s continuation, is a story of obsession and love in a painfully slow adagio. Ummaaa… I haven’t been the most social and engaging for the past months. It’s either swamping my sorry self for the OBG seminar, staying up overnight for the ridiculous advance theories of communication class, Quantitative Research Methods class, Media Ethics etc. Or chugging old and new fics from good ole faithful FFnet. I finally realize that reading the hand book from our lecturer are for douchebag, but I just can’t stop trying to finish this stupid book on popular cultures and media. I did told you how my brain was completely fried after reading one chapter from this book, right? Then my media ethics lecturer throw us a fotocopy worth of Rp 10.000,00. I swear I can sleep on that book and have nightmare for the whole night. But the thing that breaks my heart the most was, all of them are in English. Don’t get me wrong, I love English and England and all those blue-white-red crosses. Oh god -scratch- that, I ADORE them. If there’s any place I want to be is to be back in London and probably working at British National Library with Ms. Gallop, working on some news paper or whatever. The heart break was from the amount of high level, far fetched, vocabulary, wordings, sentence proportion and all the passive adjective that made my focus waver on the second line of a paragraph. These book are mean. A sentence could string into a whole paragraph that consist of 8 lines. How the hell am I supposed to figure what the author was trying to say? Reading in snippets is out of the window, the books are just too complex and elaborate and gaaah!!damnit. I even ran out of words trying to explain this exploding feeling inside of me. Perhaps, maybe I spent too much time reading non-real literature works. Meh, I can’t spent a day without checking FFnet, and my bookshelf are rather boring at the time. I’ve finished the complete works of Sir Arthur Conan Doyle’s Sherlock Holmes a long time ago. I can’t read ‘Norwegian Woods’ without risking my head to combust, again. My ‘To Catch a Mocking Bird’ is still with a good friend of mine, hmm.. better check it’s stats.